So far there has been no successful way to stop the progression of keratoconus. Current methods using rigid contact lens or intra corneal ring segments, can only correct the refractive error (spectacle numbers), but it has very little effect on the progression of the condition. Eventually, 21% of the keratoconus patients require surgery to restore eyesight. A new, non invasive treatment, based on collagen cross linking with Ultraviolet A (UVA, 365nm) and riboflavin (Vitamin B 2), a photosensitizing agent is now available. This changes the biomechanical properties of the cornea, increasing its strength by almost 300%. This increase in corneal strength arrests the progression of keratoconus as demonstrated in numerous studies all over the world. Corneal Collagen Crosslinking with Riboflavin (C3-R), a one-time application of riboflavin eye drops to the eye, has proven to be a great success. 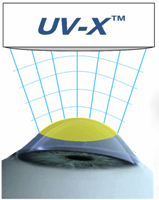 The riboflavin, when activated by approximately 30 minutes illumination with UV-A light, augments the collagen cross-links within the cornea and so recovers its mechanical strength. Collagen cross-linking treatment is not a cure for keratoconus, rather, it aims to slow or even arrest the progression of the disease. Patients may need to continue to wear spectacles or contact lenses (although a change in the prescription may be required) following the cross-linking treatment but it is hoped that it could limit further deterioration in the patient's vision and reduce the need for corneal transplantation. If you have been diagnosed with keratoconus, I encourage you to call today to schedule a consultation.